Here is what's blooming in my garden this week. I transplanted these Stella de Oro Daylilies last year and this year they are amazing. It's been so hot lately (90-100) that I can't bring myself to go outside and deadhead them. I forgot to share this photo of the giant cinnamon roll that a friend of ours brought back from a trip. It was big enough for three people! Notice that it's bigger around than my teapot. "Harmony Cottage" and listed it on eBay last night. The welcome mat is always out at Harmony Cottage for family and friends who stop by for coffee shared in the garden. Patsy and Lonnie bought their cozy little home two years after they were married. With a lot of hard work and sweat, their little cottage became a home. They learned gardening together by trial and error and now share cuttings and starts from their plants with other young couples just getting started. Your daylilies look wonderful! 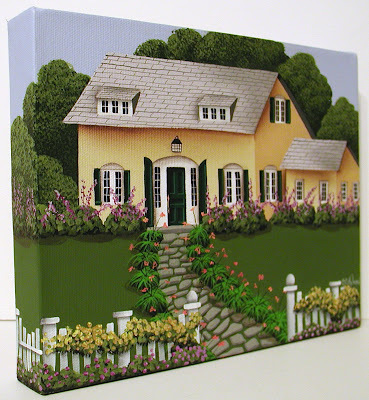 I love the Harmony Cottage painting too. 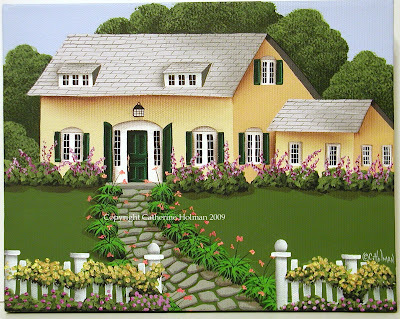 I would love to live in any of the beautiful houses you create Cathie! oh Cathie, another lovely painting! 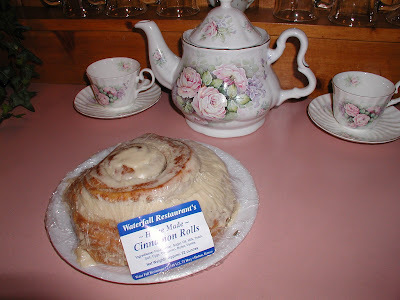 So charming :-) and that cinammon roll is HUGE! I would be quite the selfish hog and try to eat it all myself too and then get sick. I'm so bad with sweets! Your lilies are gorgeous and the painting, too!! I love it! We arrived at the lake this morning. The temp at 5PM is "only" 90.:-) Better than a few days ago. The daylilies are gorgeous along with your painting. And that cinnamon roll is huge!! Love the painting, perfect as always. I have those lilies and mine are huge this year also, must be the right year for them! Life, not the heat is keeping me from deadheading them. Is that what they're called? I always wonder when I see them because they are such a lovely shade of yellow. I can see why they inspired you to such a lovely creation. Beautiful daylillies and a great painting as well. The lillies look great! I have some of them blooming right now too. Love the cottage. Looks like it would be a nice place to retire to. Well, I can see why your daylilies inspired you to paint that wonderful painting! Both are just gorgeous. I love the yellow. Gorgeous daylillies, Cathy! My hubby and I are transferring some from my mom-in-laws! Your garden looks as harmonious as your painting. So very lovely. Love the daylilies and I absolutely love the Harmony Cottage pic! Catherine, your paintings are wonderful. I love the really clean look of each one. And I love the teapot you have sitting on your table. I am so glad I found your blog! Yuuuummmm, Cinnamon Rolls. Heat it up and top it with Ice Cream. I will get back on track, I Have been working on a contract painting. I'm with you on deadheading flowers right now. I have a little gardening tool holder called a "Grasshopper" with wheels. I sit on that to dead head but right now the heat is just too much. I want to move in! !